KATY PERRY: PART OF ME THE MOVIE- Closes Down Hollywood Blvd! “Katy Perry: Part of Me” – The Movie, Closes Down Hollywood Blvd! On Tuesday night Hollywood Blvd. received thousands of Katy Perry fans for not only her movie premiere – a concert documentary film about her climb to fame called “Katy Perry: Part of Me The Movie”, but also got a spectacular live concert! L.A. Premiere of KATY PERRY: PART OF ME. Crowd on Hollywood Bvd. Katy Perry on the red carpet of her movie premiere in Hollywood. 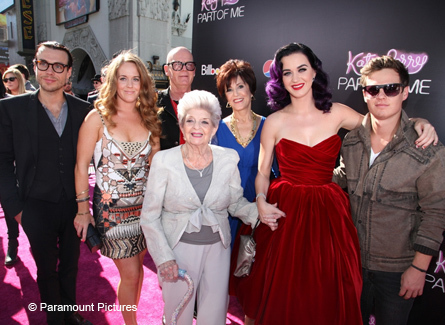 Katy Perry with her family on the red carpet for her movie premiere. Katy Perry with her back-up dancers at the Hollywood premiere. Coming soon from; Insurge Pictures, Pulse Films, AEG Live, Imagine Entertainment, MTV Films, and Paramount Pictures. Rated PG for; some suggestive content, adult language, and brief smoking. Read HOLLYWOOD JUNKET’s article “KATY PERRY: PART OF ME – Reveals Her Childhood in New Teaser!” Limited Sneak Peek on Monday, July 2, 2012. Opens in theaters everywhere on Thursday, July 5, 2012 get your tickets now and ENJOY THE SHOW!